The Coated aluminum sheet has advantages like simple cleaning, easy maintenance, elegancy and magnificence, good flexibility, easy processing and fabricating performance, easy installation, light weight, high strength, extreme rigidity, superior impact resistance, excellent surface flatness and smoothness, good heat insulation, sound insulation, acid-resistance, alkali-resistance, good weatherproofing and non-resonance, various uniform colors, and more. 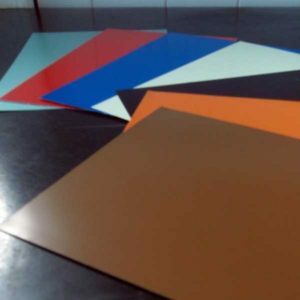 The Coated aluminum sheet can be used for interior wall decoration, low building cladding, shop face decoration, partitions interior decorations, and more. This building material is also ideal for use in billboards, signboards, ceiling, eaves, balconies, kitchen, bathroom, galleries, tunnels, subway interiors and other entertainment places. As a professional manufacturer and supplier of Coated aluminum sheet in China, we also provide 5 bar aluminum tread plate, aluminum strip, aluminium slit coil, anodising aluminum sheet,aluminum sheet, diamond aluminum tread plate, and more. Whenever you have a need for any of our products, please feel free to contact us .